Welcome to the latest revolutions! V-Kart - for easy manoeuvring of pipe, steel and other lengths of materials. Loadall – for stress-free transportation and storage of large sheets of board. FittingStor – for innovative storing in narrow spaces. No competing products come even close in terms of unique design, distinctive safety features and of course quality and durability. We are certain that the new Armorgard products will make your job easier, significantly safer and more enjoyable. 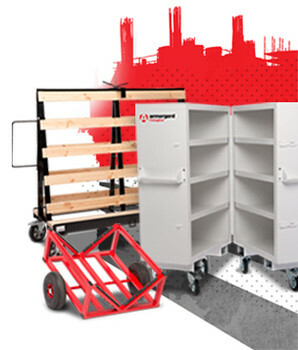 The demand for the Armorgard TuffBank™ range of tool vaults has never been so high, with well over 10,000 TuffBank™ products supplied in the past year! Regularly requested by Health and.